- Select and test the proper K-9 for scent detection. - Create behavior modification through classical conditioning. - Practice clear and concise K-9 communication. - Shape K-9 behavior through positive reinforcement. handler in addition to directed search patterns. teach your dog to find target odor and disregard distractor odors. - Set up a successful maintenance training schedule. - Use, maintain, and store real and pseudo odors for training. - Teach a passive alert and reward from source (AKA- The sit and stare at odor source). Our five-day K-9 BSD Basic Trainers Course encompasses all disciplines of scent detection using the Behavioral Shaping Device (B.S.D.) Method. Our 40-hour basic trainers course will give the students the knowledge on how to properly select a K-9 for scent detection, imprint them on target odors using B.S.D. Technology, and teach them to train a K-9 to independently search operational areas. We also offer an Advanced K-9 BSD Trainers Course that covers buried I.E.D. (Explosives) Detection and Body Worn Explosives Detection. 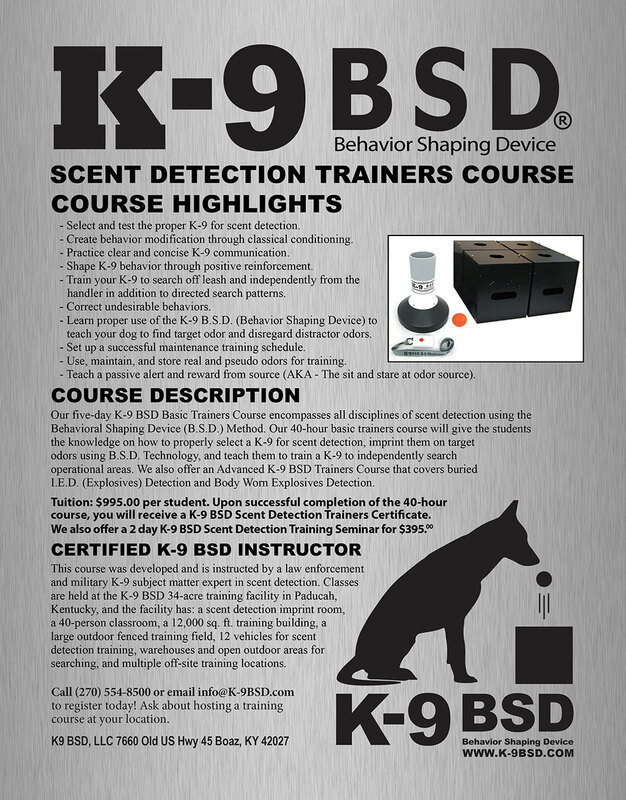 course, you will receive a K-9 BSD Scent Detection Trainers Certificate. searching, and multiple off-site training locations.